The sun is behind Elijah. 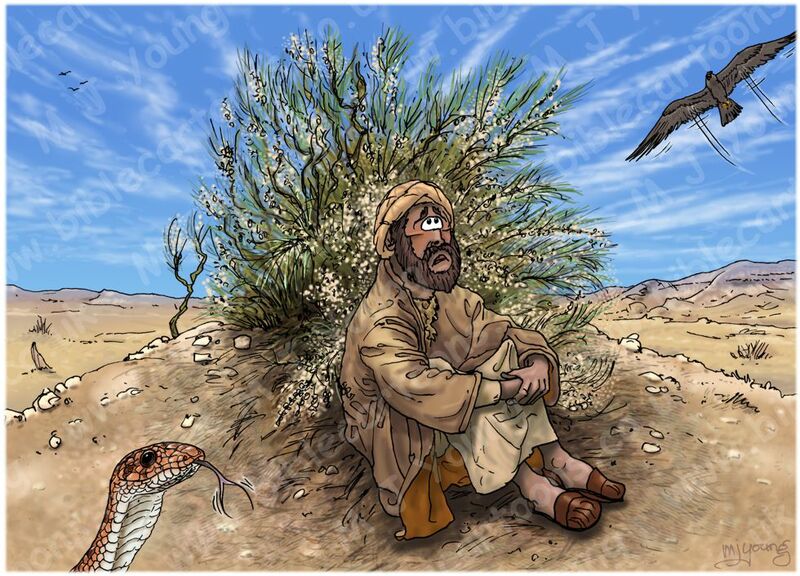 This scene shows a very depressed looking Elijah, under a broom shrub, in the desert wilderness. 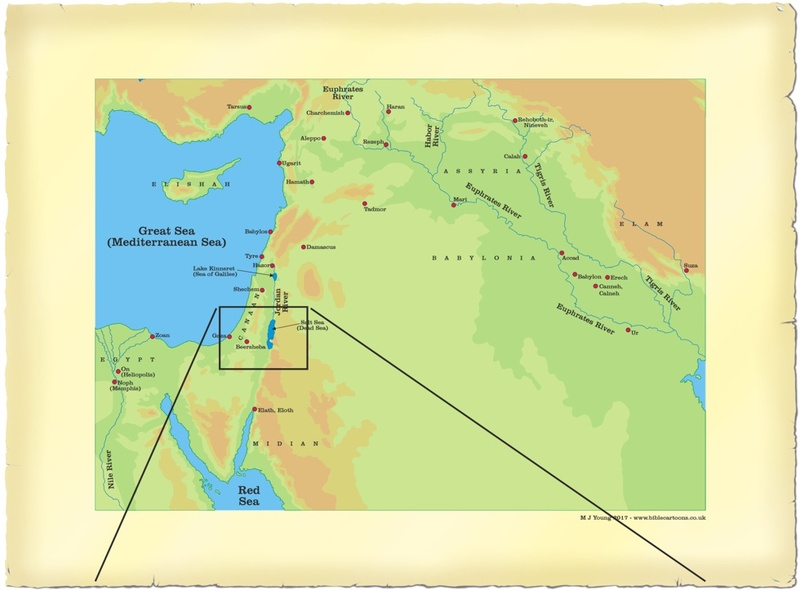 I’ve looked at the topographic and geological maps of the area around Beersheba, and worked out that if Elijah walked a day’s journey (perhaps 10 miles) southward, he would have ended up in sand dunes of the desert wilderness. 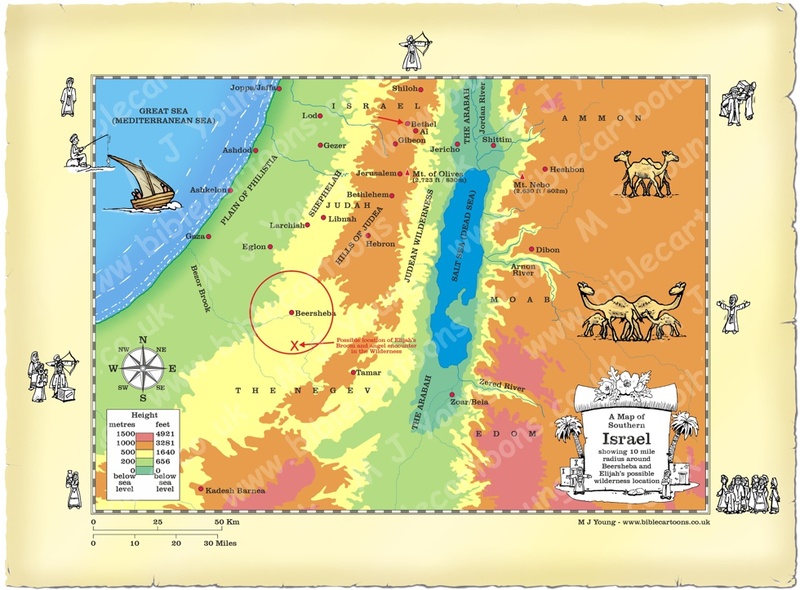 South of Beer-sheba, rainfall quantities drop sharply, and the landscape becomes increasingly rugged, barren and arid; a region called the Negev/Nebeg. 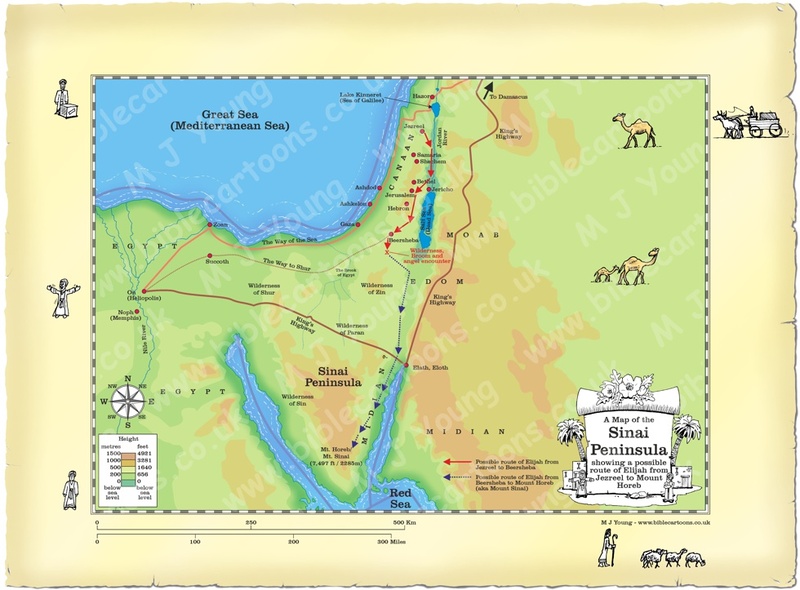 The Wilderness of Zin – see Numbers 34:4 (also called the wilderness of Kadesh – see Psalm 29:8) stretches southeast of Beer-sheba, while portions of the Wilderness of Paran intrude from the Sinai near Kadesh-barnea. The region is a mass of jagged peaks, craterlike depressions (called a makhtesh), sand dunes, and desolate plateaus… a great place for Elijah to “get away from it all!” I have drawn sand dunes and rocky outcrops in my scene to represent this most inhospitable location. A note about the bird. The grey bird in the top right is Falco concolor (aka Sooty falcon) is a medium-sized falcon breeding from northeastern Africa to the southern Persian Gulf region. This is an elegant bird of prey, 32–37 cm long with a 78–90 cm wingspan. It is shaped like a large hobby or a small Eleonora’s falcon, with its long pointed wings, long tail and slim body. The adults are blue-grey, and lack the black underwing coverts of the Eleonora’s falcon. The young bird is like a large juvenile hobby, or small juvenile Eleanora’s falcon. Its dark trailing edge to the wings and tail distinguish it from the former species, and it lacks the underwing contrast caused by the dark coverts of the larger falcon. A note about the snake. 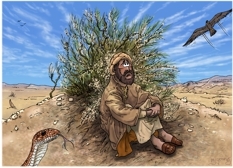 The snake in the bottom left, looking at Elijah is Lytorhynchus diadema (aka Common Leaf-nosed Snake, ascrowned leafnose snake, Awl-headed Snake, Crowned Leafnose Snake, Diademed Sand Snake, Diamond Snake) A little-known, burrow-dwelling reptile, the most distinctive feature of the awl-headed snake (Lytorhynchus diadema) is its shovel-shaped, projecting snout which is used as an adaptation for digging into sand while seeking out prey. With undulations of the elongated, cylindrical body and medium-sized tail, the head, with sunken mouth and enlarged scales, is thrust into the ground and the sand is pushed away. The awl-headed snake varies in colour from pale yellow to yellow-brown or reddish, although a series of dark rectangular blotches on the upperside and smaller spots on the sides of the body are largely retained. There is a chocolate-brown circle or ring on each side of the head behind the eyes, which are usually joined by a brown bar, and a dark stripe runs from each eye to the corner of the mouth. The underside of the body is a uniform white or cream. A note about the Broom “Tree”. Most Bible’s translate the plant mentioned in verse 4 as a broom tree. Some (ie KJV, ASV) call it a juniper tree, or Raetam. After a bit or research I can see that what is called Raetam in some translations actually is Broom, specifically Retama raetam (aka White Broom, White Weeping Broom) a shrub native to northern Africa from the Western Sahara to Sudan, Sicily, the Sinai Peninsula and Saudi Arabia, and widely naturalized elsewhere. In fact it is more likely to have been a shrub, rather than a tree, which is what I have drawn in my scene. Evenari considers the range of this plant more limited, excluding such places as Lebanon and Mount Carmel from which it has been recorded by Post and other workers.